Kurtis is wonderful because they are comfortable and come in different patterns and fabrics. They not only go with palazzo pants, cigarette pants and leggings but also with jeans. 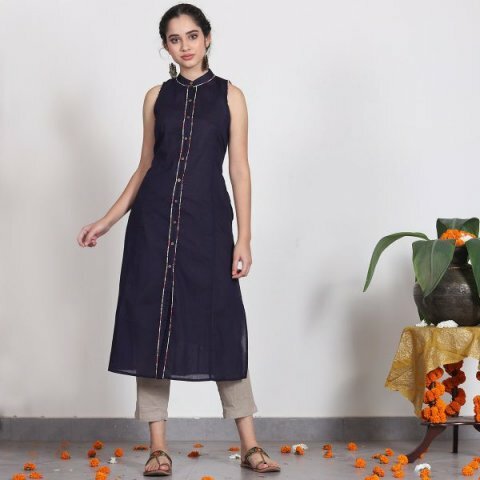 Jeans with kurti create a fusion of ethnic and western wear. However, it is important to pay attention to the length of the kurti. 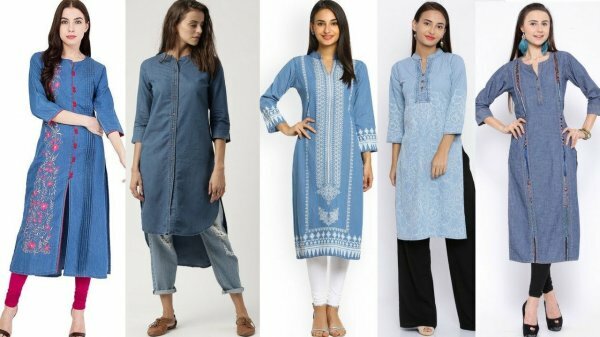 Normally, short length kurti look the best with jeans. Apart from that, long length kurtis with high slits also look good with jeans. 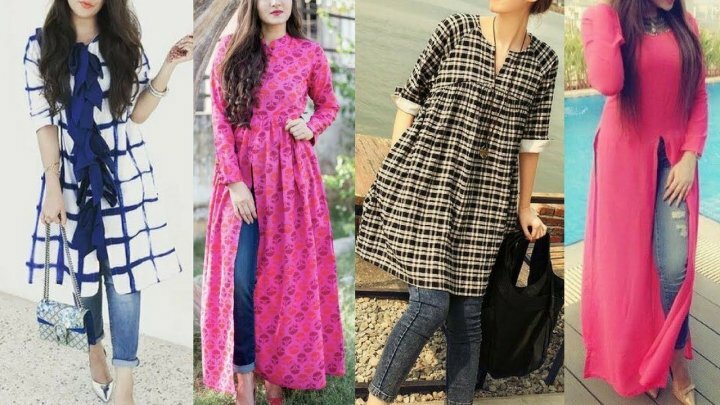 Avoid wearing kurtis which have a length up till the ankle with jeans as such kurtis only look good with churidar or leggings. High low kurtis also look great with jeans. Wear ankle length jeans with kurtis and you are all set to sizzle. Kurtis can be stitched in almost all fabrics. Hence, there is a wide range available for you to choose from. Modern or quirky prints really look good with jeans. Choose prints which have animal or bird motifs. Manufacturers are also experimenting with wacky prints. The market is full of quirky prints like scooter, rickshaw and dream catcher motifs. Try picking up something like that instead of the usual floral or mango prints. Kurtis are also available in prints like stripes and geometrical shapes. Opting for minimalistic prints which are just near the neck and cuff is also a good idea. Try and be creative and have fun with your kurti shopping. Traditional kurtis would look equally good with jeans. Choose for kurtis with gota patti or reham work borders. Even kurtis with deep necks and long sleeves would look great with jeans. Apart from that, kurtis which have the traditional mirror work techniques or dori work would also look nice with jeans. 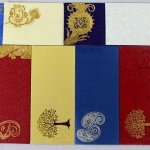 You can also choose kurtis with bandhej, shibori, batik and block printing techniques. Pair such kind of kurtis with jhumkas and juttis to complete the whole look. Do not be afraid of experimenting. Putting together a different, yet interesting whole look will give out a great vibe. . Fabric play a major role in deciding a silhouette of almost any garment. Thus, choose your fabric wisely. Also, it is a good idea to opt for cotton, malmal and rayon fabrics for casual kurtis. Some of the silk kurtis also look good with jeans if you are looking for an indo-western option for festive wear. Kurtis also have a lot of different cuts. Normally, a straight cut kurti looks best with jeans. However, you can experiment and wear an A-line kurti with jeans, provided it is short in length. Kurtis with front slits also looks great with jeans. 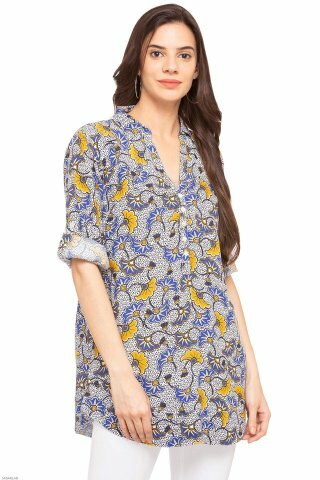 SANAA Womens Collared Printed Kurta from shoppersstop.com is a great choice. The fabric of this printed kurti is woven. Made out of premium quality fabric this is a comfortable kurti that can be worn daily to work. The kurti is printed with yellow and blue coloured floral motifs. It features a collared neckline and 3/4th sleeves. It can be washed in the machine. Pair this kurti with mild wash jeans and white heels and you are all set to rock the look. The kurti is priced reasonably for Rs. 299 and thus, can be given as a token gift to your friends as well. Kurti and jeans is a versatile combination because it can be worn to college, office or for a casual outing. Rayon Cotton Blue Colour Short Kurti from colorpetal.com fits all the three occasions perfectly. 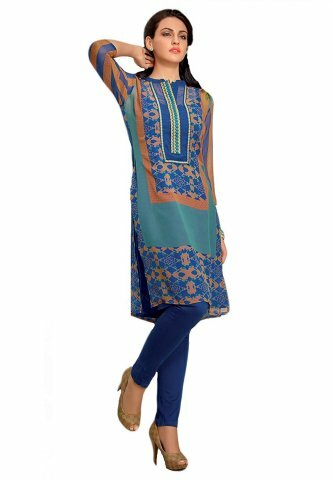 It is a blue coloured printed kurti with 3/4th sleeves. The kurti contains white coloured floral motifs. It has a flat collar and a beautiful embroidery of basic stitches on the placket. The placket also has a tassel detail in yellow colour with a wooden button. Rayon fabric has a great fall and is super comfortable to wear in summers. Pair this kurti with a black denim and hoop earrings. It is priced at Rs. 599. Sleeveless kurtis look really graceful with jeans. Try thisBlue Sleeveless Kurti with Floral Placket and Collar Detail from rustorange.com. It is a long kurti which has its length up to the calf. 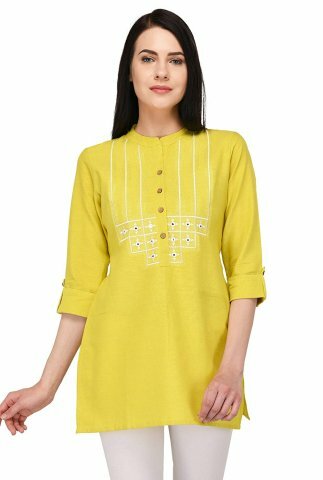 The kurti has a flat collar with a button placket. The placket goes down till the hemline which looks really smart. The kurti also contains wooden buttons and piping on the neckline and sleeves. The piping is of a contrasting fabric which makes the kurti look different. It is a hand dyed kurti and thus, it is recommended dry cleaning. Pair it with traditional jhumkas and it will look great. The price of the kurti is Rs. 599. Lobaanyn Series Dark Pink Short Kurti from cilory.com is a great piece. The colour of the kurti is very vibrant which makes it look fresh and nice. The colour is fuschia pink which will look amazing with blue denim. The kurti has a flat collar with a buttoned placket. It contains pearl work and embroidery near the neck. The embroidery is in a combination of off white and yellow colour. It also contains pintex detail near the embroidery. The kurti is short and is stitched in A-line pattern. It is made of georgette fabric and has an inner material of santoon. The exact length of the kurti is around 88 cm and it is priced at Rs. 799. You can flaunt this kurti and jeans combination on a movie date as well. Pick this Ajio Flared Kurti with Embroidery from ajio.com. The highlight of this kurti is that it has a tie-up back and raglan sleeves. The kurti is a good amalgamation of the western silhouette with ethnic embroidery. It is made out of cotton and has a Chinese collar. The embroidery designs are contemporary circle motifs which are scattered throughout. The kurti does not contain any darts and has a length which goes up till the knees. It can be washed in a machine and can be used for daily wear. 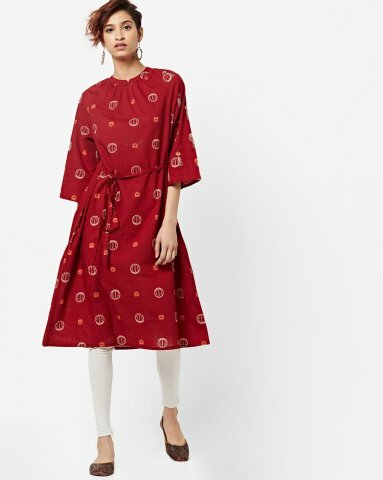 The kurti is red in colour and it is priced at Rs. 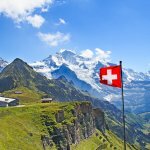 899. Rangriti Women's Notched Neck Printed Tunic from shoppersstop.com is a great option to pick. It is made of good quality woven fabric and is pink in colour. It is totally printed with creepers and mango motifs. 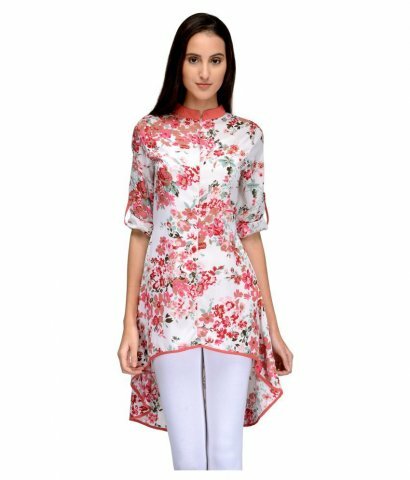 The kurti is pink in colour and the print is white in colour. One great detail about this kurti is its elbow length sleeves. The sleeves are white in colour and the print on them is pink in colour. It looks great and unique. The kurti has a round hemline in the front. It is also a high low kurti. It has a notched collar and a round back. Pair this up with white coloured jeans and it will look amazing. The kurti is priced at Rs. 599. Kurtis are practical items. Not only are they easy to shop but they are also easy to gift. 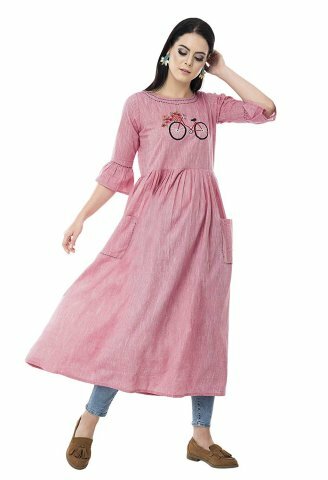 Haniya Pink Cotton Kurti from snapdeal.com is one such kurti which you might want to shop for yourself and your best friend. The kurti is soothing to see as it is in baby pink colour. Apart from that, it has lacework and crochet detail. It has a comfortable fit and looks very feminine. The lace work is used mostly at the hem and cuff. It has a flat collar with 3/4th sleeves. The fabric used is soft and airy and is perfect for summers. Pair it with your blue denim and silver earrings. The kurti is priced reasonably at Rs. 442. 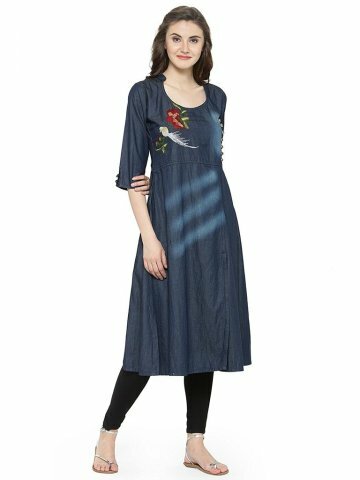 If you want to try an anarkali kurti with your jeans, then opt for AnjuShree Choice Women Stitched Printed Rayon Anarkali Kurti from amazon.com. It is a smart frock style kurti which is long in length. It has a boat neckline and 3/4th sleeves. The sleeves contain flared hemline. Apart from that, the kurti contains 2 box pockets near the thighs. This detail makes it look really smart. The kurti is pink in colour and has an embroidered yoke. It contains a quirky cycle motif with pretty flowers. It is pink in colour and thus, will look good with blue jeans. The kurti is priced at Rs. 599. If you choose your collection wisely, then there are certain kurtis that you can wear for casual parties as well. Tunic Nation Multicoloured Crepe Asymmetrical Hemline Kurti from snapdeal.com is one such piece. It is a printed kurti which is made out of crepe fabric. It has rose bunches printed overall. The kurti has an asymmetrical hemline which makes it look really dressy. The base fabric of the kurti is white and it has pink and red coloured prints. The kurti has a Chinese collar with 3/4th sleeves. The hemline also has a thin border in pink colour. Pair this kurti with a white denim and silver heels and you will be all set to party. This Ajio Embroidered A-line Kurti with Bell Sleeves is a beautiful piece from ajio.com. The kurti can be worn on a lunch date or for a meeting in the office. It is made out of 100% slub cotton fabric and is peach in colour. The kurti has a cutout detail in the front and has a panel construction. It contains bell sleeves which are in totally in trend. It has multicolour floral embroidery on the yoke. The interesting part is the placing of the embroidery which is set diagonally from the neck. The kurti is knee length and contains no darts. 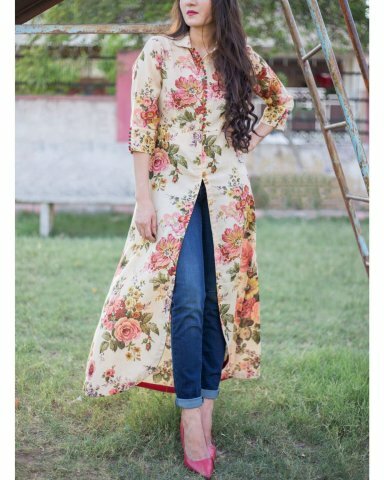 This particular kurti will look great with any colour denim. It is of great quality and is a bit pricey at Rs. 1799. 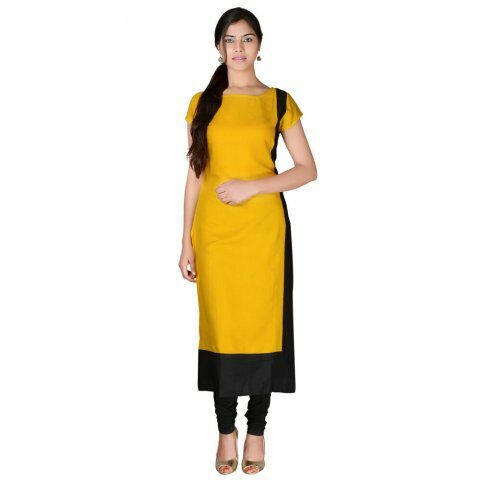 If you are looking for a casual wear kurti, then amazon.com has a great range. Pistaa's Women's Cotton Short Top is one item which is budgetary and comfortable. It is lime green in colour and is made of pure cotton. It has a Chinese collar with wooden buttons on the placket. The kurti contains subtle embroidery in the yoke part with stitch line in lime green colour. The embroidery is white in colour. The sleeves are 3/4th and have buttoned plackets on the hemline. 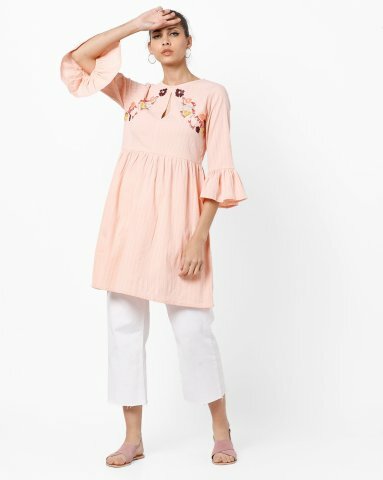 This is a perfect kurti to wear while going grocery shopping or finishing mundane tasks. It is priced at Rs. 599. Kurti and jeans is the most comfortable combination in the world. However, if you want to dress up a bit you will have to accessorize. Kurti and Jeans sometimes look over casual. To avoid that, you can add a thick belt on your waist and make it look modern and dressy. Apart from that, you can choose to wear heavy neckpieces. A good neckpiece will totally change your look. 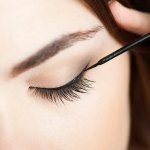 You can also try to curl or straighten your hair for a different look. Apart from that, you can wear scarves with kurtis as they look really fashionable. Also, there are 4-5 different ways to drape a scarf. Pick a style that suits you the most. You can also do some layering as it is very much in fashion. Try wearing sleeveless jackets or shrugs with the kurtis. This gives a different and great look. Wearing boots with kurtis also looks good and quirky. Whatever your style, just make sure to carry it with confidence and a smile. So many styles to choose from. Everyone can find at least one or two styles that would suit. Whatever part of the world you are from, you can always rock a kurti. Choose what suits your style. Though kurti and jeans are comfortable to wear by themselves, add a bit of accessory to come out looking exceptionally chic.